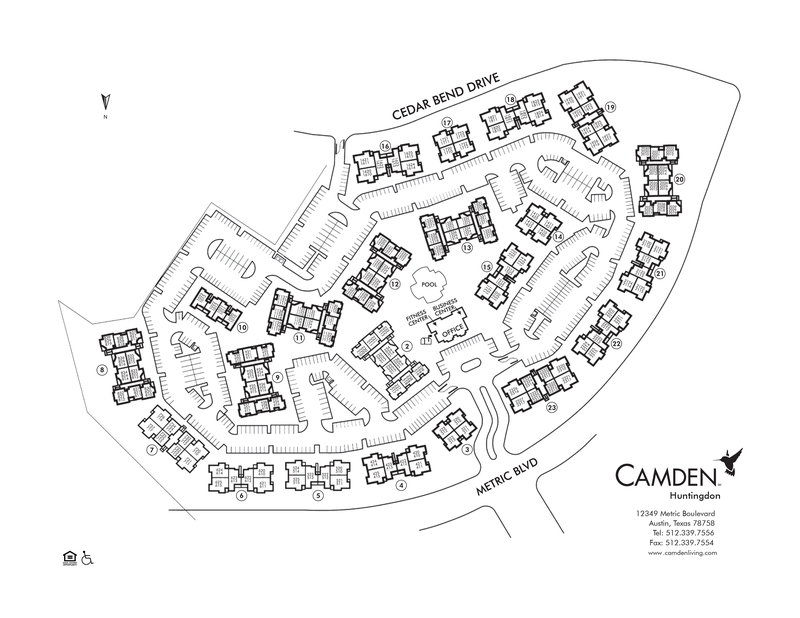 The one and two bedroom apartment homes at Camden Huntingdon define luxury living in Austin. Our apartment homes are conveniently located between Mopac Expressway and I-35 within one mile of both Austin Community College and the North Austin Medical Center. Enjoy living minutes away from hundreds of upscale shopping and dining options at The Domain and The Arboretum. And take advantage of the 300 acres of wilderness at Walnut Creek Park with its off-leash dog park and miles of mountain biking and hiking trails. Our Austin apartments feature high-speed internet and WiFi, cable, and a washer and dryer in every home. The luxury apartment homes at Camden Huntingdon also offer stainless steel appliances, modern cabinetry, and hardwood-style flooring. If you need a little extra space, we offer private garages with storage as well as covered parking spaces. Entertain your neighbors and friends at our beautiful swimming pool and outdoor grilling area with plenty of shaded poolside seating. We also feature a 24-hour fitness center and resident lounge with WiFi. Camden Huntingdon is pet-friendly community that accepts large pets (75 lb maximum weight limit) too. Residents receive a technology package included in the total monthly rent with a savings of up to 58% off retail. This money-saving package includes high-speed internet up to 300 Mbps and 225+ channels including over 120 HD channels and HBO. Looking for more options? Access Time Warner Cable TV and HBO Go from your smart device + over 250,000 Time Warner Cable WiFi hotspots nationwide. Life is more exciting at Camden Huntingdon! View our available floor plans today. At Camden, your pets are family too! We welcome cats and dogs, up to two pets per apartment home, with no weight limit. We have detached garages available for $85 per month and carports are available for $30 per month.